Thank you for your continued use of our facility! Take the Canine Good Citizen Test! We will conduct a Canine Good Citizen Test on July 17 at 7:00pm. To sign up, please email us at caninefun@aol.com and reserve your spot. 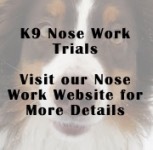 Seattle Agility Center offers Nosework Classes! on beginning obedience and STAR puppy classes. 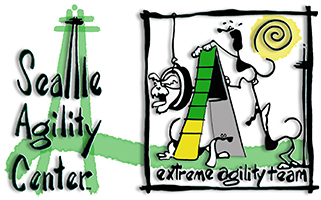 Doug Ricks, Diana Harris and the great team of instructors at the Seattle Agility Center are delighted to offer classes 7 days a weeek in agility and obedience. Our facility is convenient to 1-5, 1-405 and Highway 18 for easy access. At Seattle Agility Center, we believe that through training and shared activities, people and their dogs come to better understand and respect each other, develop stronger relationships, and truly enjoy playing, working and living together. We are dedicated to providing a fun, safe and supportive opportunity for you to participate in agility, obedience, and nosework activities with your dog.